"This rare White Bear is actually a Black Bear! Scientists are actively studying this rare genetic trait that is possibly due to a recessive gene, or could be due to a result of a concentration of gene in a given area. The Spirit Bear is not an albino. 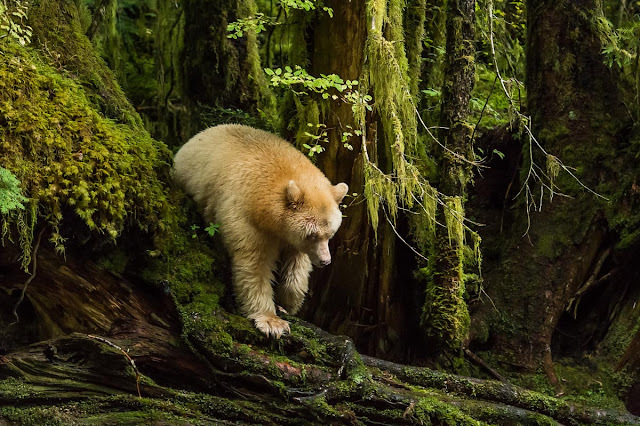 Scientists estimate there are 1,200 black and white Kermode bears in the coast area that stretches from around the northern tip of Vancouver Island northwards to the Alaska panhandle. On Gribbell Island, up to 30 per cent of the bears can be white while on the larger Princess Royal Island, about 10 per cent have the white coat. Like most bears the Spirit Bear weighs about half a pound at birth, growing to 150-300 pounds when fully grown. The Kermode’s size averages between 4 and 6 feet. Height measured from paw to shoulders averages between 2 ½ and 3 feet. The beautiful Spirit Bear will eat almost anything. Including you! However, there have been no reports of them eating people.